Our zesty blend of authentic Mexican seasonings is sure turn any ordinary meal into a tasty South-of-the-Border experience. Rich in flavor, and not too hot; Add to beef, chicken, and bean dishes. Create authentic and flavorful tacos and burritos. 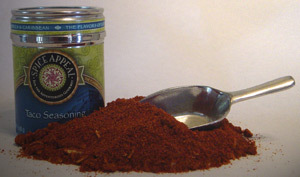 Mix 4 Tbsp of Taco Seasoning with 6 oz of water, add to 1 lb of browned, drained ground beef or cooked chicken. Simmer for 10 minutes until the sauce starts to thicken. Also delicious when added to sour cream for making dips.